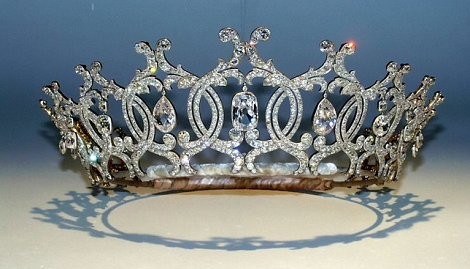 The celebrated Portland Tiara - seen by incalculable individuals of the public - was stolen from The Welbeck Estate in Worksop, Nottinghamshire. Burglars broke into the Portland Collection Gallery on the estate between 9.45pm and 10pm on Tuesday night. They stole the tiara and a diamond brooch from an armoured glass display case while the alarms were sounding. The centre-piece of the tiara is the Portland Diamond, which dates from the 19th century and is flanked by two diamond drops and other pendant diamonds, all set in gold and silver. Police are appealing for information about a silver Audi S5 suspected to have been involved in the offence. Detective Inspector Neil Humphris said: "We're pursuing a number of lines of enquiry but we believe there are people out there who may have crucial information that could help with our investigation. "We particularly want to hear from anyone who has any information about a silver Audi S5 which is suspected to have been involved in this offence. This vehicle was found abandoned and burnt out in Cross Lane, Blidworth, about half-an-hour after the incident.